Jamat ud Dawa chief Hafiz Mohammad Saeed on Monday made a rare public appearance to lead the funeral prayers for Kashmiri leader Maulvi Showkat Ahmed Shah, killed in Srinagar last week, and used the occasion to rubbish the India-Pakistan cricket diplomacy while vowing for a "jihad" in Jammu and Kashmir. In a provocative speech, Saeed, the mastermind of the 2008 Mumbai terror attacks, claimed the movement in Kashmir would serve as an example for "Muslims in Hyderabad and Junagarh who want independence from the oppression of Hindus". New Delhi has been pressing for action against Saeed who continues to roam freely in Pakistan making anti-India tirades. In Islamabad, this has been the second time since the 26/11 attacks that Saeed has made a public appearance. "The stand taken by the Pakistan government for friendship with India is not acceptable to the Pakistani people under any circumstances," said Saeed, who led the 'ghayebana namaz-e-janaza' for moderate Kashmiri leader Maulvi Showkat Shah, who was killed in an explosion in Srinagar on April 8. Saeed, also the founder of the banned Lashkar-e-Taiba, said "friendship, trade and cricket diplomacy" with India has no meaning. "We make it clear that (the government) should back the Hurriyat till the last breath for the independence of Kashmir," he told a gathering of about 300 people outside the National Press Club in the heart of the Pakistani capital. Members of Parliament and the government should adopt a "strong position" on the Kashmir issue so that it becomes clear to the people of Pakistan and Kashmir that they are "doing the right thing", he said. "We want to make it clear that we are with Kashmiris and will remain with them... All the people in Pakistan and Kashmir are unwilling to accept anything less than independence (for Jammu and Kashmir)," he said in a brief speech as the crowd repeatedly cheered. He said rather than put efforts to foster friendship and trade with India, the Pakistan government should work to support the movement to achieve the "independence" of Jammu and Kashmir. Paying tribute to Shah, the president of the Jamiat-e- Ahle Hadith who was killed in the bombing on April 8, Saeed claimed the movement in Jammu and Kashmir was " a jihad for independence where even death is part of life". 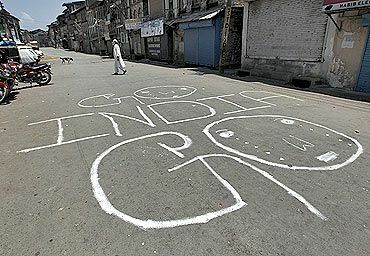 Dismissing the impression in certain quarters that the movement in Kashmir had become weak in the post-9/11 era, Saeed said he believed "it has come very close to its final stage". Saeed claimed that the Kashmiri leaders had kept alive their movement even "when Pakistan was under great pressure" and the government in Islamabad "always gave in to pressure". 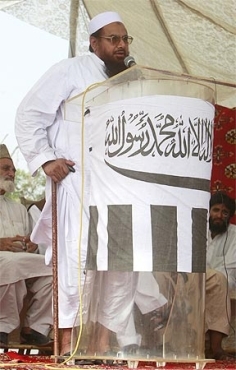 Besides Saeed, the gathering was addressed by Abdul Aziz Alvi, the head of the JuD in Pakistan-occupied Kashmir, United Jihad Council vice-chairman Muhammad Usman and leaders of the Hurriyat Conference. Both Saeed and Alvi were briefly detained in the wake of the Mumbai attacks, which were blamed on the Lashkar-e-Tayiba. Saeed had attended a gathering of political and religious leaders in the capital last year to oppose changes in the controversial blasphemy law. He has led several rallies in Lahore during which he criticised India and backed calls for "jihad" in Jammu and Kashmir. Referring to the situation in war-torn Afghanistan, he claimed this was a sign that India could not continue what he described as the "occupation" of Jammu and Kashmir. 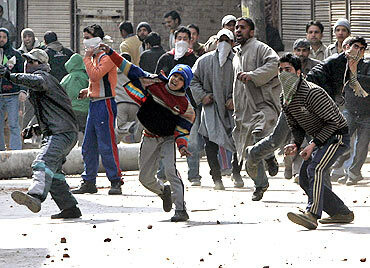 "I want to tell India this is not that era when Muslims were silent (and) things have changed. 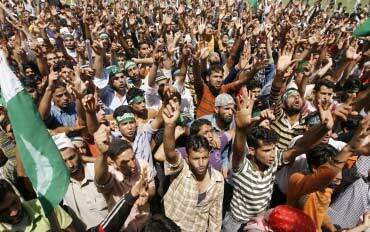 Muslims have become aware," he said. "If Russia could not continue its occupation of Afghanistan, if America is preparing to pull out and they are admitting that they have failed in their mission in Afghanistan and they cannot continue their occupation... then India cannot continue its occupation of Kashmir," he claimed.